Dianna L. Grayer PhD., LMFT is a multi-talented woman with vision. Dianna, a Marriage and Family Therapist with a practice located in Petaluma, loves to work with clients who want to heal, change, and grow. She is an author, professor, workshop creator and facilitator, playwright, and co-hosts Living Proof, a radio show on KRCB’S Outbeat Radio. She has produced and directed her LGBTQ+ play, Private Lives Private Lies in 6 different locations around the North Bay (and another is coming July 21 & 22 in Cotati). For fun she writes, enjoys nature, plays Pinochle and bowls in the LGBTQI league in Rohnert Park! 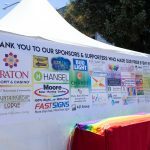 Sign-up now - Stay Connected With Sonoma County Pride!